Mashed potatoes have a long, drawn-out history—especially, ironically, in instant form. Guess the recipe for the Thanksgiving icon is harder than it looks. — A passage from, The Art of Cookery, an 18th-century recipe book written by English author Hannah Glasse. This is widely believed to be the first-ever recipe for mashed potatoes, appearing as early as 1747. (Here’s a version from 1765.) As cited by the basic description offered above, Glasse was a major fan of simple language, and that likely helped the book become one of the most famous cookbooks of all time. In some ways, the potato was destined to be a tough sell to some portions of the world, particularly at an earlier point in history. They sound weird if you explain them: They grow in the ground, they’re largely flavorless, and they grow sprouts. And when they came to Europe (Spain, specifically) by way of the Andes in South America (possibly through the Canary Islands), their value as a potential food source wasn’t always appreciated. In some parts of Europe, the plants were only considered valuable as animal feed. But that may have been in no small part due to the lack of a good spokesperson. Fortunately, one of those eventually appeared—and he won over France, one of the most skeptical parts of the entire continent. 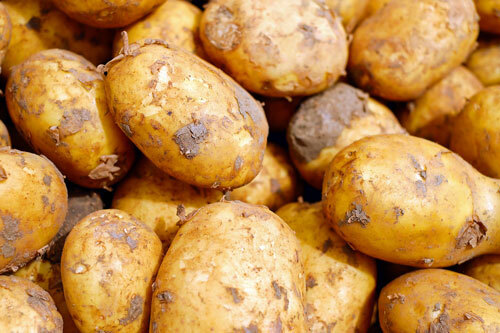 Heck, France even banned potatoes because they thought the vegetables would cause leprosy. Antoine-Augustin Parmentier, an 18th century advocate of the tuber, came upon the potato during the Seven Years War, during which time he was a prisoner of war. The pharmacist learned something that a lot of people did during Europe’s various wartime eras, according to Potato: A History of the Propitious Esculent: The fact that the potato grew in the ground meant that it would survive war when grain harvests didn’t. 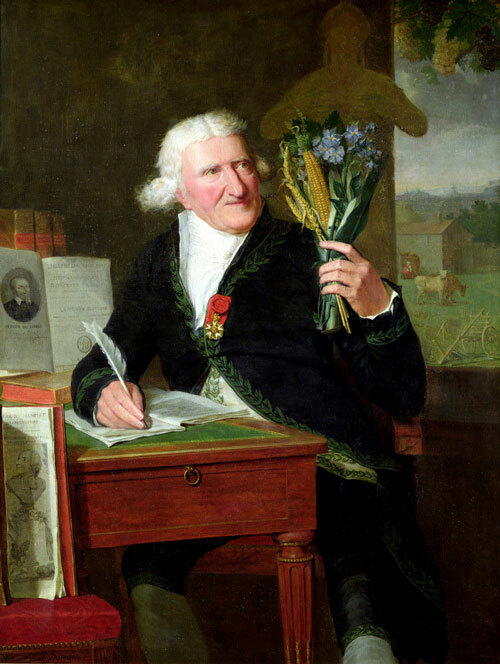 And after the war, Parmentier—who credited his survival during the war to the potato, which didn’t cause him leprosy—became an advocate for and experimenter with the vegetable, encouraging its use in different forms, including mashing. Not only was it a miracle vegetable of sorts, but it tasted great. According to The Farmer’s Almanac, he even convinced the French government to repeal its ban on potatoes in the 1770s. It took a little time, but by the time of his 1813 death, the potato had become one of the most popular foods in all of France. His role in the French awakening to the potato is widely reflected in the names of many of its potato-based dishes—particularly hachis parmentier, the French version of shepherd’s pie, which has a layer of mashed potatoes on top. Not a bad place to be historically, huh? These days, when you think of French’s in reference to food, you immediately think of mustard, among other condiments. In fact, if you look at their website today, the company only sells five lines of products: Mustard, ketchup, crispy fried vegetables, dried potato sticks, and Worcestershire sauce. They were the first commercially, but a lot of soldiers got a taste of the spuds during World War II. During the war, efforts were made to see if it was possible to expand the life of vegetables through dehydration. Potatoes were particularly well suited for this purpose, and were heavily used by the U.S. military during the latter years of the war, between 1943 and 1945, with levels largely dropping off after that point. Potatoes were by far the most popular dehydrated variety of vegetable during wartime, followed far behind by sweet potatoes. And much research was done during this period on the value of dehydration of potatoes in particular. The most successful efforts to make instant mashed potatoes during this period, however, came not from the U.S., but the United Kingdom, thanks to Theodore Rendle, who filed one of the first patents for the concoction in the U.K. in 1942. Rendle, working on the issue for his employer Chivers & Sons Ltd., took inspiration from a number of sources. In a 1945 edition of the publication Food Manufacture, Rendle highlighted some of his thinking during a recitation of a paper about the preservation of potatoes. Canning was certainly possible, but Rendle thought it too heavy, while he argued that quick-freezing wasn’t an effective solution. Two other men, Maine’s Olof Pierson and Idaho’s J.R. Simplot, each came up with the frozen french fry around the same time in the late 1940s, proving Rendle wrong. Rendle, however, saw inspiration in the potato ricer, which could be used to press out potatoes in a flakier form, with the output later dehydrated. He spent much of his 1945 talk discussing various dehydration methods. Those methods provide the bedrock of the modern instant mashed potato mix. 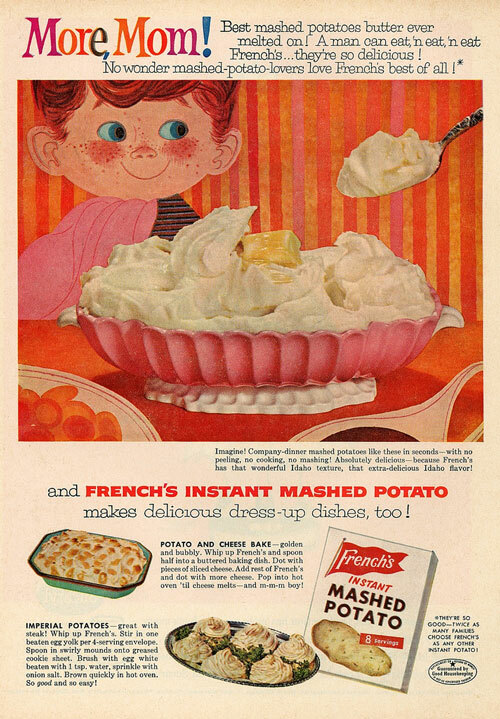 Ultimately, it was Rendle’s work on instant mashed potatoes that French’s licensed to produce in the U.S. in 1946—as its parent company at the time, the U.K.-based Reckitt and Coleman, also assisted in researching mashed potatoes at the time. All well and good. But there was a problem, as noted by a 1974 Sioux City Journal article: The U.S. military’s wartime take on mashed potatoes was really, really bad. Soggy. Nothing like real mashed potatoes. And that meant French’s product the grocery equivalent of kryptonite at first—not because it wasn’t a worthwhile idea, but because it reminded soldiers of a bad memory. Slowly, the company found success for its potato products. But while dehydrated mashed potatoes were already being sold commercially, the U.S. government was already working on making them better. Which meant that French’s wouldn’t always be the king of instant mashed potatoes. 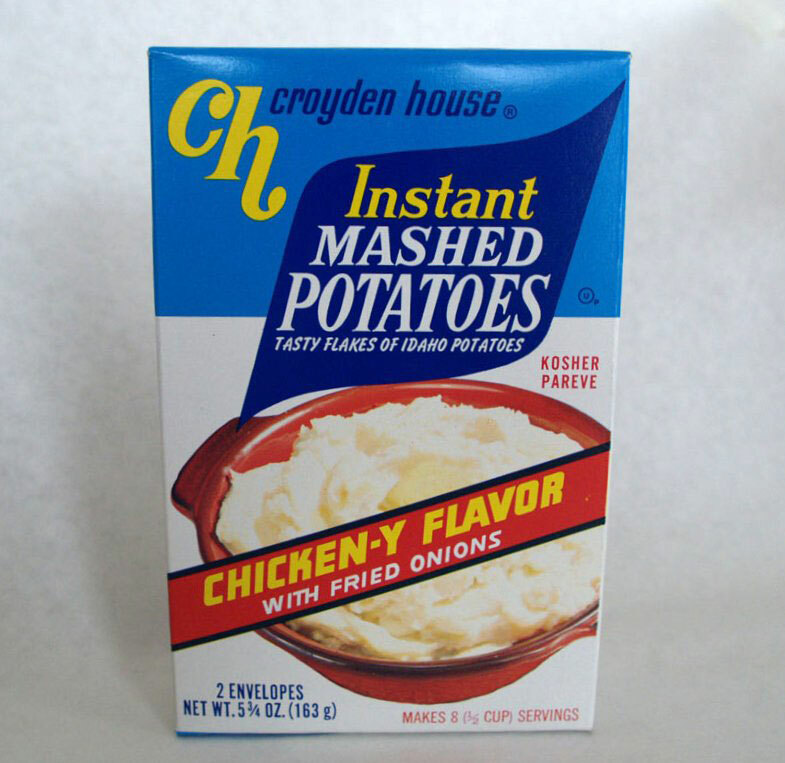 The year that Idahoan, perhaps the best known modern maker of instant mashed potatoes, got its start. The company was formed by a group of farmers who decided to launch a potato dehydration plant. The company, in an article about itself that it sponsored, says it’s constantly innovating its potato-making process, hoping to solve a constant issue for consumers. “Sadly, experience has shown that many consumers who have a bad first experience with the category never return,” CEO Drew Facer said in the sponsored post. 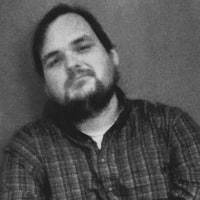 The U.S. government gave instant mashed potatoes the reputation that they were awful and to be avoided—and later, they were the ones who ended up fixing that reputation, for the most part. The good work came out of the Eastern Regional Research Center (ERRC), an United States Department of Agriculture research facility in Wyndmoor, Pennsylvania, outside of Philadelphia. The facility, set up in the 1930s, was one of a handful that focused on food production methods. Starting in the 1940s, USDA researchers at California’s Western Regional Research Center began working on dried potato granules, which were used in some of the earliest instant mashed potato products. But they had their issues—the biggest one being that they were hard to make quickly. ERRC’s focus on “flaked” potatoes, versus granules, proved a major turning point. The American Chemical Society, which gave the facility a National Historic Chemical Landmark designation largely for its work on potato dehydration, noted that the methods created by the facility largely changed the commercial outlook of that potato. The researchers came up with a three-step process called the “Philadelphia cook”—first, to pre-cook the potatoes so they don’t get soft but so that the the potato starch starts to solidify; then, a cooling period to further solidify the potatoes, followed by a second cooking period; and finally, a drying process immediately after the potatoes are mashed up. This approach, which hit the commercial market around 1957 or so, changed the mashed potato game. The GIs who came home to memories of soggy mashed potatoes soon found themselves having to rethink what it meant to eat mashed potatoes that come out of a box rather than through a whole lot of peeling. If you look on the internet even a little bit, you’ll find some site somewhere telling you you’ve been cooking your mashed potatoes all wrong, and you should rethink you ways. Sometimes, small tweaks such as boiling the potatoes halfway (as the instant potato folks do it) can prove hugely important. The wrong potato, likewise, is a recipe for disaster, apparently, as is the failure to salt the water. Some even suggest you just have to rethink the approach overall. Food Network guy Tyler Florence says you should cook your potatoes in cream and butter, rather than simply adding cream and butter at the end of the process. This sounds like a wild suggestion, but he has kind of a point behind it. “Potatoes have a really delicate, beautiful minerality to their flavor profile, and when you cook potatoes in water and you pour that water down the drain, you've extracted all the flavor of the potato,” he recently told PopSugar. During his cooking process, he pulls out the potatoes when they start to get tender, collects the cream via a bowl under a colander, and puts the cream right back in with the potatoes. Maybe he’s right. Maybe he’s wrong. He sounds like he knows what he’s talking about. Either way, this is a recipe we’ve been working on for like 300 years now. Hopefully, someday, if we are actually “doing it wrong,” we’ll get it right. Possibly with gravy.